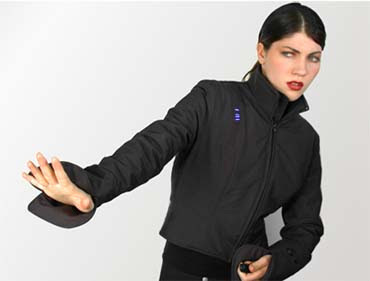 The No-Contact Jacket (shown above) is a stylish way to keep the bad guys away. A mesh of electric armor lies just beneath the outer shell of the jacket. Whenever it's activated by the wearer, 80,000 volts of current deliver a painful shock. Anyone grasping the garment will instantly lose his balance and become disorientated. It won't kill an attacker--it'll just give him a little something to remember you by. Where do I get one. o cool! i'm afraid i'm to asleep to write any more. This is the coolest blog ever. The jacket is also cool. I wis there were more contests though, I missed the last ones. How much do they cost. Icouldn't find a price. Fun thing to wear to a school dance -- when someone asks you to dance, and you don't want to, BZZT! How could anyone wear that without developing a serious twitch from constantly checking to make sure that your hands aren't anywhere near the activation button or whatever?? lol. Woah - another thing to add to the wishlist! How much do they cost? It even looks cool. I bet it costs a mint. I'll wait and get one when they invent a jacket that lets you shoot lightning at people a few feet away. My annoying co-worker comes over, bzap! Go'way, I is workin'! thats awesome, but how do you put it on w/o shocking yourself? so is it activated at a push of a button or something? I feel bad for the people who had to test them!